San Remo has epitomised the culture and tradition of pasta making since its inception in 1936, when it was founded by Luigi Crotti. Today, it remains a privately owned 100% Australian company. From its earliest days the company grew rapidly and was the first manufacturer to support and foster supermarket distribution as this new shopping phenomenon became established and grew. Manufactured in Australia, San Remo has offices and distribution centres in all main capital cities throughout Australia and New Zealand, and exports to 35 countries throughout the world. San Remo’s manufacturing site in Adelaide combines the traditional Italian pasta making “know how” with the most modern technology. San Remo’s Durum wheat mill is one of the largest and most sophisticated in the Australian/South-East Asian region, and was specially designed for the processing of Durum wheat. San Remo contracts growers to grow its top quality Durum wheat, thus guaranteeing control over the quality and specifications of the wheat. This results in pasta of the highest quality, and ensures high standards of integrity. Today, San Remo has a wide range of pasta products and sauces and also offers a range of “La Pasta” pasta and sauce side dishes. San Remo is a 100% family owned and operated business and we are proud to have been part of Australian families for over 80 years. Our latest “We’re Family” commercial celebrates both our heritage and the powerful family bonds that unite all Australians across all generations. Watch it below or on Youtube. San Remo has been a treasured part of homes for generations and our packaging and advertising has had a long and remarkable history. The central feature of San Remo pasta packaging were the two “San Remo Brothers” in the kitchen, cooking pasta. The San Remo Brothers symbol would eventually become the mark of San Remo quality. See below the San Remo Pasta Leaflet from the 1950′s. 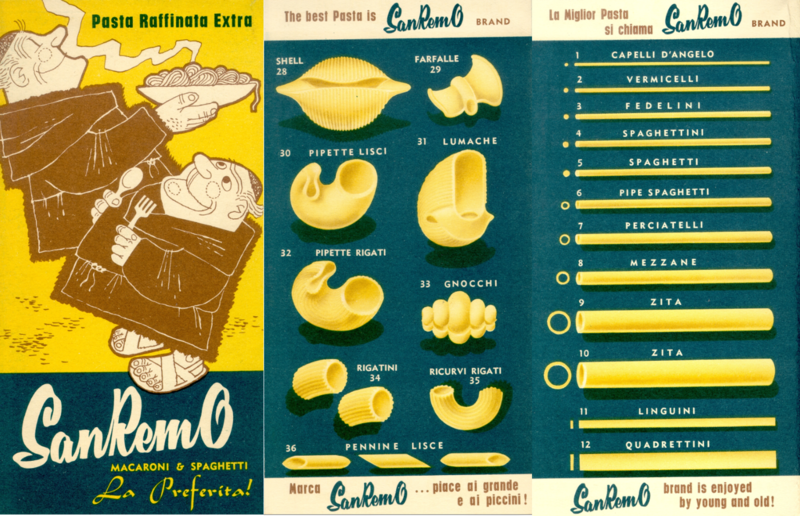 This historic leaflet shows many of the traditional pasta shapes available from San Remo at the time. Once again, the San Remo Brothers featured prominently on the front of the leaflet, enjoying their steaming bowl of pasta. As the years progressed, San Remo moved to a more modern pack with the signature San Remo red colour making a bold statement. Gold ribbons were also added to the pack to signify the premium quality and taste of San Remo pasta making it a recognisable icon in homes around Australia and New Zealand.